This tool helps drive 2.5" extra wide barbed staples over your coated wire fencing while preventing the staples from mushrooming when driving into harder wood posts. Save your fingers; they will thank you! Save your fingers from having to hold each staple with a barbed staple starter. This tool prevents staples from mushrooming when driving into harder wood posts. It's very simple to use; just insert the staple into the slot and hammer on the other flat end to set the staple to a proper depth. We suggest using the staple starter to start the staple into the post and finish driving the staple into the post with a hammer. *If you push the staple starter into a post when driving a staple, the head of the staple starter can break. Do not staple your coated wire fencing tight onto the line posts. Use this starter with the 2.5" extra wide staples. *Note: This item does not work with regular 1.5" or 2" barbed staples; they float in the starter. 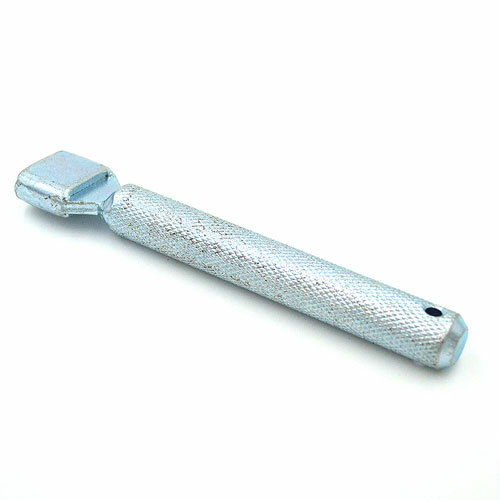 - Great tool for pounding in staples! Shipping: This item ships via USPS or UPS.